An entrepreneur's value system and his long-term commitment to the startup idea are among the key factors that influence Tata Sons chairman emeritus Ratan Tata's decision to invest in a new-age venture. While Tata invests in only those ideas that excite him, he also needs to get a good impression of the team backing the venture, the 78-year-old said at a fireside chat on Wednesday. "I see it as a worthwhile experience, if the concept excites me. What do I feel of the founders? What is their first impression? Is he/she only in it for the short term? Does he/she have passion for the sector? I am a very numbers-driven person," Tata said in a candid conversation with Kunal Bahl, co-founder and CEO of Snapdeal, at TiECON Mumbai 2016. Tata, one of India's most respected corporate leaders, believes an entrepreneur's strength of character comes to the fore in a crisis. "I think everyone will agree that you really find out about a person's value system in a crisis, the day you are threatened of becoming non-existent. How you deal with it is a mark of leadership," Tata said. "One can determine a person's value system only once you watch them closely, their working and their organisation. Intuitively you can make judgements by observing how they operate their business. However, we should not confuse ambition and aggression," he added. Tata said he would not deter from bailing out of a startup that does not follow ethical practices. "Reminds me of the time I was put on the board of [a] pesticides [company]. The sales manager came to the board meeting and said what a bad year it had been, there were no pests, the crops were fine. I left the company the next day," he said. Tata has invested in about 20 startups ever since he hung up his boots as the chief of the Tata Group in December 2012. He was one of the most active angel investors in India last year, having put money in firms such as Crayon Data, UrbanClap and KAARYAH. 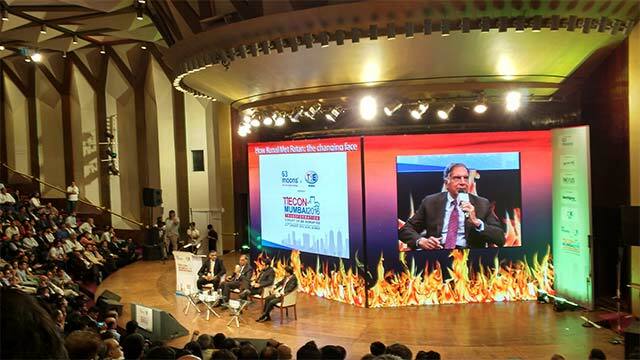 Tata is building a portfolio of new-age businesses across sectors ranging from consumer internet â€“ particularly e-commerce â€“ to social impact, e-health, home services, animal care and clean-tech sectors. In 2016, he has put money in animal lover's portal Dogspot and startup data analytics firm Tracxn. In August 2014, Tata invested in Snapdeal, which is run by Jasper Infotech Pvt Ltd.
Bahl believes Tata's investment in Snapdeal worked as a good luck charm for the e-commerce marketplace. "Is there a doubt? About 95 per cent of the capital we raised as a company came after Tata's investment. He is much more than a good luck charm," Bahl said in response to an audience question. In August 2015, Snapdeal raised $500 million (Rs 3,250 crore) in fresh funding led by Taiwanese iPhone contract manufacturer Foxconn, Chinese e-commerce giant Alibaba and existing Japanese investor SoftBank. Does Tata have the risk appetite for more startup investments in 2016? He chose to be vague about it. "I have a view that one's personal investment should remain a personal investment. Unfortunately, the media seems to make it an issue of being in the public domain. You don't have to ask me, you just have to read it in the media," Tata said. He is fine with the fact that several of his investments may not yield the desired result. "I realise that not all businesses will succeed," he said. Kunal Bahl Ratan Tata Snapdeal.com Tata Sons Ltd.